Sandy Hill is a community located just South-East of Ottawa's downtown core. of its residences, its numerous embassies, and its important institutions. presence of a skilled workforce with good local resources led to the varied house styles. many undesirable businesses and building renovations at bay. 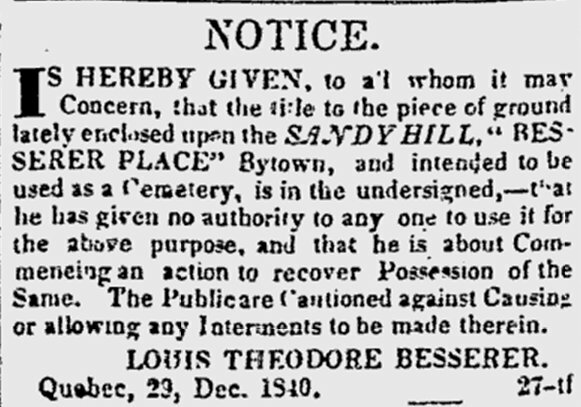 The community of Sandy Hill is perched atop a hill just south of The By Ward Market. diverse class base, it was not always so. 30 years the people of Ottawa had logged the trees which once crowned the hill. the North and South sections of the community. '˜lost leaders' (HIST 3209, Thurs. Oct 17th, 2002). not just an average little community. attract people, but maybe they were designed to attract a certain type of person. Sandy Hill an ideal community? understand why Sandy Hill homes look as they do. them up all played an important role in the building of Sandy Hill's homes. enough, they were a group of people united by social class, not ethnicity. diverse people brought with them diverse architectural styles. probably enjoyed an increase in the number and diversity of tradesmen. gable atop its panel and inset windows in its double door" (Fletcher-195). a good example of Ottawa's fine tradesmen and their wide range of available resources. 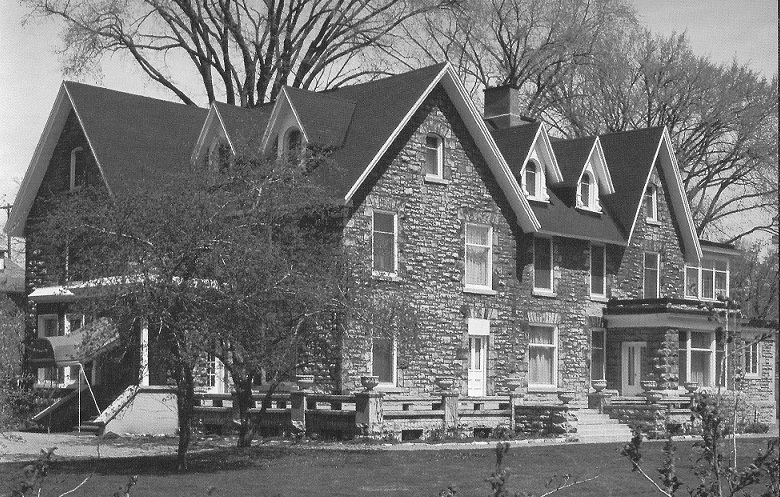 Patterson House of 245 Augusta, "is a cream-coloured stucco Gothic cottage"(Fletcher-186). church which burned down and was replaced by Sacre Coeur Church. "insufficient parking spaces, potential noise and alcohol issues..."(Fletcher-183). preserving its heritage sites and older buildings. density housing (referring to apartment buildings, not terrace and town homes). early 1900's in response to the demand for more housing adjacent to downtown" (183). new residents and enterprises to the community. architecture of homes, ranging from huge mansions to quaint bungalows. of undesirable businesses in the area tell of the community's strong voice. 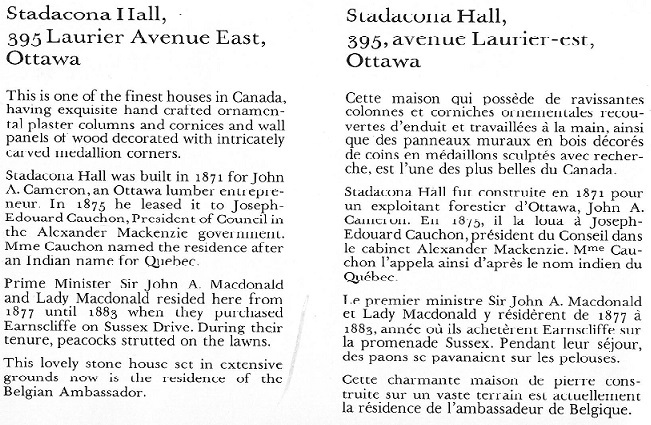 #1. http://sfuo.ca/static/home/about/uottawa/index  History of the U. of O. Student Federation of the University of Ottawa. (Accessed on Oct. 21, 2002 and Oct. 24, 2002). #2. Eggleston, Wilfrid. The Queen's Choice (1961) The National Capital Commision, Ottawa, Canada. #3. Fletcher, Katharine. Capital Walks: Walking Tours of Ottawa (1993) McClelland &Stewart, Toronto. #4. Gwyn, Sandra. The Private Capital (1984) McClelland &Stewart, Toronto. #5. Haig, Robert. Ottawa: City of the Big Ears (1975) Haig and Haig Publishing Co., Ottawa. In 1841, the Act of Union joined Upper Canada and Lower Canada into one province. on the periphery of two provinces. (e.g. Bronson and J.R. Booth), moved to higher ground above Nanny Goat Hill. Gilmour (I think) at Arnprior and others at Buckingham, and Mckay at the mouth of the Rideau. workers, in Bytown/Ottawa, close to the Chaudiere Falls. from the rest of Carleton County, to which many of Ottawa's tax dollars went. acquired by a land development company owned by group of local speculators. was a station. J. R. Booth's railway entered the city and ran along what is the Queensway today. of the Rideau Canal, past todays Conference Center, which was originally the CNR Station. to Laurier Avenue. This estate was managed for him by J.W. Stewart (Stewarton on the map). politicians and civil servants moved here from the Maritimes. Where would they all live? neighbourhood in Lowertown. They made this location decision based on race and religion. The upper income politicians and civil servants chose their neighbourhood based on income. RC Church, St. Alban's Anglican Church and Bytown College - now the University of Ottawa. neighbourhoods of Lowertown and Sandy Hill. See Capital Walks by Fletcher for more details concerning Sandy Hill and Lowertown. You could try contacting Serge Barbe who is the archivist for the City of Ottawa. He may have the information or will be able to direct you to the source. Hi, I am a descendant of the Besserer family, grandson of Georges Besserer. Land for the Bytown college, it is a well acknowledged reality. I think the U of O.
stone on this huge...huge lot. For any other info that I may have, write to me. I am also a great great grand daughter Of L.T. is Alex Besserer, of North Bay (where's there is a street named after him). and the names of any brothers or sisters he may have had. My name is Sylvie Besserer-LeBouthillier, grand-daughter of Dorcy Besserer and Grace Forget. you had done some genealogical research on the family name. Any information on Louis Theodore's children would be greatly appreciated. he was still in Germany? history back quite a few years! wife's name was Loretta. Could he have been one of your grandfather's brothers? He probably would have been born between 1900 and 1910, as a rough guess. Whatever I find I will share with you. I believe Samuel was my grand-father's brother. we kids swam (often all day). caught all the fish. Good memories for kids growing up in 1950's Ottawa. "Honeywell" and "Rice". Rice was one of his sons. by local volunteers in conjunction with the City of Ottawa. 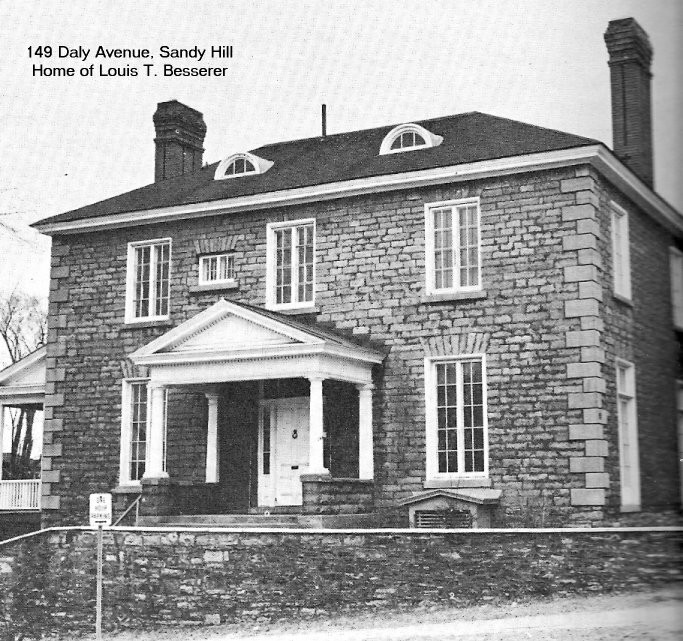 Sandy Hill home at 149 Daly Avenue, once owned by Louis T. Besserer. Have a look at the Sandy Hill Draft Heritage Report. Sacre Coeur Church on Cumberland Street burned down in 1907 and 1979. The beautiful Gothic building has been re-built. 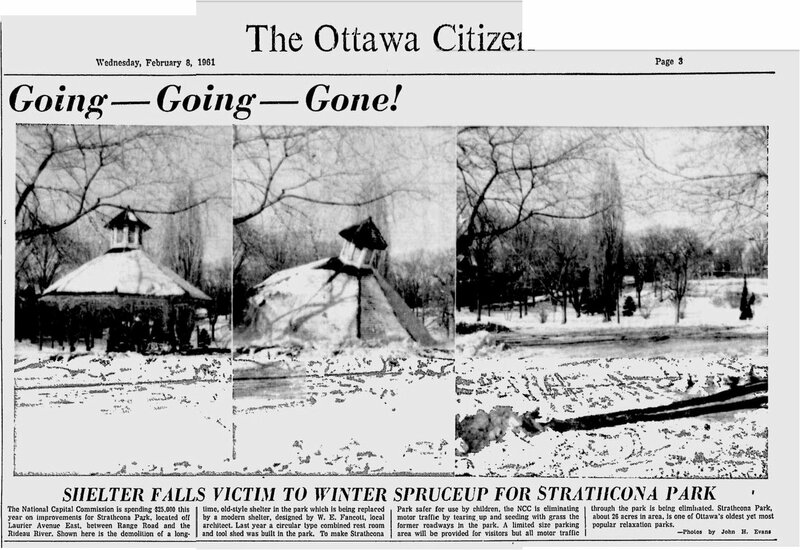 For more detailed research regarding Strathcona Park, see Taylor Kennedy's new page. Picture and Text Source: National Capital Region Heritage, page 110. Keywords: John A. Cameron, Joseph-Edouard Cauchon, (First Nations Name for Quebec City), Sir John A. Macdonald, Belgian Ambassador.